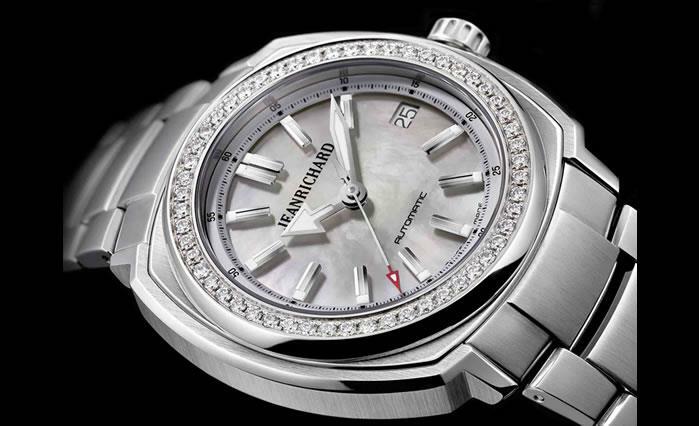 JEANRICHARD has developed its Terrascope in a second 39 mm diameter ideally suited for any wrist. This new face for the brand’s iconic model is celebrated by the launch of several striking versions, including some flagship feminine watches. A new approach for all Philosophers of Life to whom size really matters. 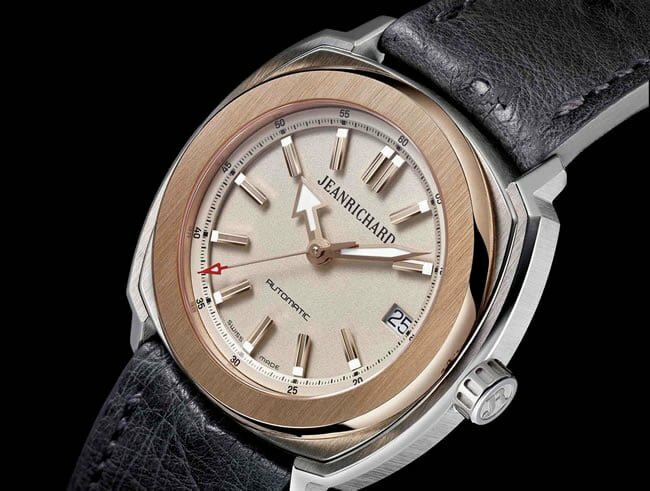 With its unique design and style that is both sporty and refined, the JEANRICHARD Terrascope has emerged as a new watchmaking icon. It bears the hallmark of a Philosophy of Life focused on discovery, adventure and the desire to go one step further each time. In addition to the basic models displaying a 44 mm diameter, the JEANRICHARD Terrascope now offers a new 39 mm size, with subtly reviewed proportions. Perfect dimensions to dress any wrist, while keeping the strong presence and assertive character of this watch alive. The Terrascope 39 mm keeps the same highly original case with a cushion-shaped middle part and the round bezel, while reinterpreting it to experience new dimensions. Its ingenious modular concept with sophisticated construction in several parts, allows materials and finishes of the different elements to be varied, giving each model a different personality – and thus meeting the tastes of all everyday life’s adventurers – now especially the feminine ones. A new feature of these innovative JEANRICHARD models is also the see-through case-back now implemented for this whole collection. Made of sapphire glass, the back of the watch gives insight on the black oscillating weight of the self-winding mechanical movement. With its new 39 mm diameter, the Terrascope, more than ever, embodies the whole JEANRICHARD Philosophy of Life with a thirst for adventure and exploration, making each day a new journey. This is illustrated by the new 39 mm version of the collection’s iconic model, with a steel case, black dial and a black rubber strap. Dedicated to men and women alike, this new strong companion displays a contemporary, understated and original style, enhanced by the refined contrast between a “vertically satin-finishing” (on the flat parts of the middle case and lateral bars) and a polished finishing (on the bevels). The vertically satin-finished black dial is decorated with suspended indexes. The contrasting shaped hour/minute hands offer excellent readability, enhanced by luminescent touches and a second hand with a red tip. 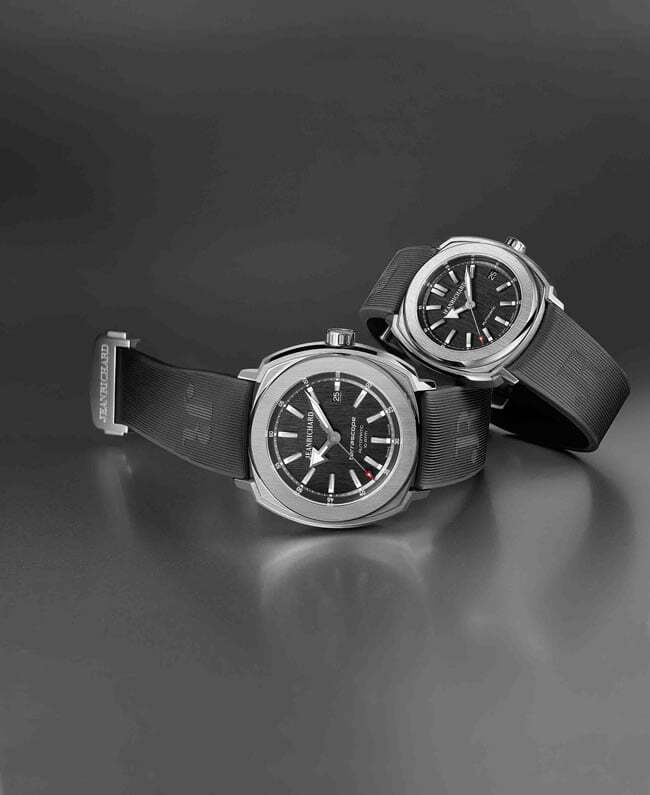 The double sided and reversible strap with its folding clasp, features either a ribbed rubber part or the “Rubbergator” when turned around and combines both sporty and elegant styles while feeling very comfortable on the wrist. This is a new emblem of the JEANRICHARD Philosophy of Life. The launch of the Terrascope 39 mm is also an opportunity for JEANRICHARD to play with different modular case possibilities by offering new models with exclusively feminine designs. These watches combine sportiness and elegance to make these new feminine timepieces both, a jewellery item and companions of every day adventures who share every moment of active living. A tribute to the woman of today and her many facets – refined and determined, adventurous and glamorous. The first model combines strength and delicacy, with a steel case pairing a pink mother of pearl dial with suspended indexes and rhodium-plated hands. The colour of the dial is mirrored by the flange and the alligator strap, offering a unique contrast to the vertically satin-finish of the steel on the bezel and the middle case. The second watch, also in steel, opts for a touch of radiance, with a bezel set with 54 diamonds and ivory-coloured mother of pearl dial, enhanced with suspended indexes and rhodium finished hands. It is worn on a steel bracelet with three linked rows that elegantly and flexibly circle around the female wrist. For the design of its third Terrascope 39 mm women’s watch, JEANRICHARD has fitted the steel case with a pink gold bezel set with 54 diamonds and combined the radiance of gala evenings with a casual chic watch. This crown of brilliant-cut diamonds dramatically illuminates the mysterious mother of pearl dial, with suspended indexes and pink gold plated hands. The jewellery-like touch is reinforced by the steel bracelet with satin finish, bevels and polished sides. The fourth women’s design is distinguished by its steel case perfectly matching a pink gold bezel and a champagne-coloured grained dial decorated with suspended indexes and pink gold plated hands. This pastel harmony is enhanced by the bracelet in grey ostrich skin. With its strong design, size to fit any wrist and refined versions, the Terrascope 39 mm offers a new dimension to JEANRICHARD’s Philosophy of Life – for men and women – and for many more “companions” of every day adventurers to come. Kara Jewellery: Bazaar Love Continues since three generations….